The complainant became aware that two purchases on his credit card statement had not been performed by him. The purchases were made using the “budget” facility at shops never frequented by the complainant. The bank statement also showed purchases that the complainant recognised as made by him. The complainant reported the purchases to the bank and requested the bank to reverse the purchases. The bank refused, providing different reasons as to why it was unable to reverse the purchases. The bank advised that the transactions were chip and PIN driven and could therefore only have been performed by the complainant or a fraudster who had obtained the credit card and PIN. Furthermore, the transactions were beyond the allowable 120-day time frame for cardholder disputes/fraud type chargebacks and the claim was declined in accordance with the MasterCard Chargeback Processing Rules and Regulations as the complainant was out of time for such a dispute to be raised. The OBS investigated and found that the disputed transactions took place at different locations to where the complainant was at the time. 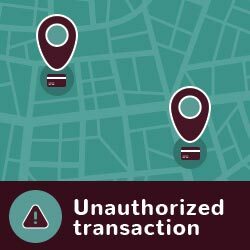 It therefore appears impossible that these transactions could have been conducted by the same person using the same original card, due to the times the transactions occurred and the distances between the locations where the transactions took place. Considering where and when the disputed transactions took place and the fact that the bank was unable to provide proof that the original card was used, the OBS concluded that there were two cards present and found no way to explain how the transactions could have occurred other than with a cloned card. In terms of the Code of Banking Practice the bank has a responsibility to “provide reliable banking and payment systems services and take reasonable care to make these services safe and secure” and a customer must keep his card safe and PIN number secret. The OBS recommended that the bank refund the complainant the disputed transactions and the bank agreed to our recommendation and refunded the complainant. PRINCIPLE: If it is found, after consideration of the evidence and on a balance of probabilities, that a complainant’s card was closed and there is no evidence of negligence on the part of the complainant in this regard, then the bank will be held liable.